The roots of Divine Savior Lutheran Church were planted in the home of Ernest Weiser, Sr., in Schattel, Texas, 1929. 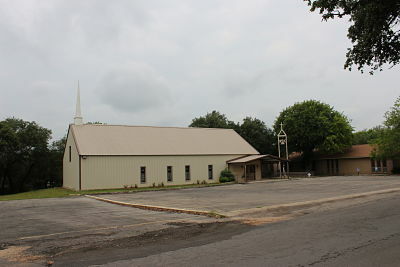 A group of Lutheran families had moved from Trinity Lutheran Church in Fedor, Lee County, Texas. In addition to the Ernest Weiser, Sr.'s family, there were the Louis Kruegers, Herbert Neumanns, and Henry Weisers. Soon after, other families joined including the Reinhold Grafs, Paul Graf, the Martin Grafs, the Alvin Grafs, the Otto Melchers, August Hornbostel, the Bill Hornbostels, and Alvin Hornbostel. As the congregation outgrew the Weiser home, they moved the Schattel school house in late 1931 or early 1932. The small Lutheran group asked the Texas District of the Lutheran Church Missouri Synod to provide them with pastoral care. The first pastor to serve was Rev. E.A. Falsken of St. Paul in San Antonio. Services were held by Pastor Falsken or various other pastors on every second Sunday of each month. On the remaining Sundays, reading services were led by Gottfried Weiser and Gustav Fischer, Jr. in German and later by Martin Graf, Sr. in English. In 1936, the congregation was officially organized and joined the Lutheran Church Missouri Synod and was accepted on June 17, 1942 at the Texas District Convention. Charter members were Louis Krueger, Ernest Weiser, Sr., Henry Weiser, Gottfried Weiser, Fred Weiser, Ludwig Weiser, Ernest Weiser, Jr., Bill Hornbostel, Paul Graf and sons, Gerhardt, Martin, Alvin, and Otto Melcher, Gustav Fischer, Jr., and Mrs. Ottilie Newman and family. On June 23, 1955, the congregation moved to Pearsall, where services were held in the Presbyterian Church building. Rev. Gerhardt T. Neumann of Messiah Lutheran, San Antonio, served the St. Peter congregation until he accepted a call elsewhere. On August 5, 1956, Rev. 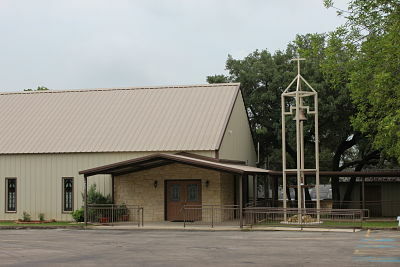 Eugene Rall was installed as the first resident pastor for the St. Peter Lutheran Church in Pearsall. In 1989, Divine Lutheran Savior Lutheran Church was formed by former members of Grace Lutheran who had a desire in their heart to have a Lutheran church in their community. A telephone campaign was conducted to contact all interested people in Devine and surrounding communities. 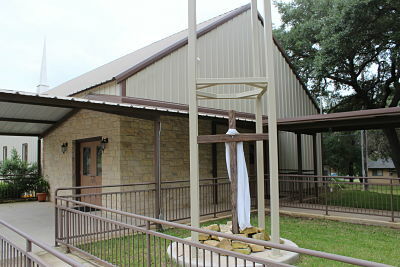 In 1990, Divine Savior began operation as a dual-parish congregation with St. Peter Lutheran Church in Pearsall, Texas. Pastor Bruce Drees was called to serve both congregations. He would conduct church services in Devine and then go to Pearsall to conduct their church service. In 1994, Divine Savior became an independent congregation and called Pastor David Londenberg as their first pastor. In 1997, Pastor Londenberg returned to the mission field where he felt called to serve. In 2000, the congregation called Pastor Dale Brynestad. This was his first assignment out of seminary. Pastor Brynestad served Divine Savior until 2003. As often happens, Pastor Brynestad received a call, and after prayerful consideration, accepted the call to another congregation in South Texas. In 2003, Divine Savior entered into a contractual agreement with Odis Doyal to serve as the pastor. Odis had been a lay member of the congregation. He signed up for the DELTO program (Distance Education Leading Toward Ordination) that allowed him to serve as a lay minister and then as a vicar while taking the necessary courses to become an ordained pastor. During June 2010, Odis Doyal was ordained as a pastor into the LCMS and accepted the call as pastor of Divine Savior. In 2015, Pastor Doyal announced his retirement, and on November 15, 2015 Pastor Doyal preached his last sermon as the Called Pastor of our congregation. The congregation is very thankful for his many years of faithful service. Divine Savior entered into the Call Process in order to call a full-time pastor. During the vacancy, Pastor Ken Bunge served the congregation. A Divine Call was extended to Pastor Randall Wehmeyer in January 2016, and he accepted the Call and was installed as Pastor of Divine Savior Lutheran on March 13, 2016. Without these and other pastors who were willing to give their time and service, Divine Savior would not have been able to continue to function as a church receiving the Word and Sacrament on a regular basis. We are grateful for our past and the blessings that the Lord has provided for his people at Divine Savior. We look forward to the future with hope, faith, and anticipation knowing the promise that the Lord gave his people in Jeremiah 29:11 "For I know the plans for you, declares the Lord, plans to prosper you and not to harm you, plans to give you a hope and a future."